Membership in PNCWA offers great opportunities for individual and professional involvement in a versatile and active environmental association. PNCWA, along with the Water Environment Association (WEF), offer a wide range of resources for individuals to contribute to the water environment profession. PNCWA promotes the professional development of our members, the dissemination of information to the public and policy makers, and the advancement of science and technology needed to protect human health and the environment. We welcome you to PNCWA and look forward to your support and involvement. 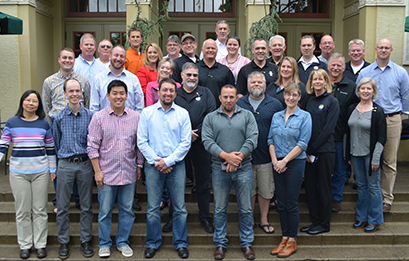 (Pictured are the Volunteer leaders of the PNCWA Board, Committee Chairs, Vice Chairs, and Communication Liaisons from the April 22 meeting at Kennedy School in Portland). Join WEF-PNCWA When you join WEF you become a member of PNCWA by choosing PNCWA as your state Member Association. Pacific Northwest Clean Water Association (PNCWA) is a Member Association of the Water Environment Federation (WEF), the non-profit technical and educational organization for water environment professionals active in 39 countries. When you join WEF you automatically become a member of PNCWA when you designate PNCWA as your Member Association. Join as a WEF/PNCWA member to receive the full benefits of Water Environment Federation membership including discounts on WEF products and services, technical manuals and books, specialty conferences, the WEFTEC annual technical exhibition and conference and a multitude of other benefits. In addition to joining PNCWA by becoming a member of WEF, a "PNCWA-Only" individual membership option is available.